With growing awareness of the irreversible loss of plant genetic resources for food and agriculture (PGRFA), there has been an immense effort in terms of human and financial resources devoted to the collection and conservation of plant genetic resources and the establishment of an institutional framework at international, national and local levels. 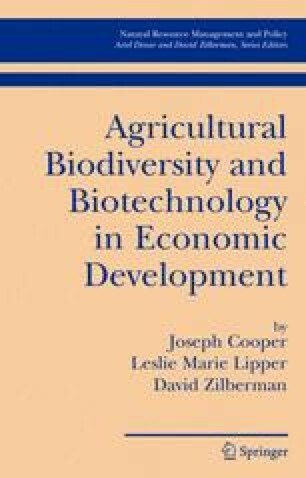 Deficits of information and uncertainties are, however, hindering an economically efficient approach to optimizing agrobiodiversity conservation. Despite the existing uncertainties, the political will of countries stresses the importance of genetic resources conservation, even though long-term conservation activities face strong competition from other, often more short-term development activities for the allocation of financial resources. Considering these circumstances, there is a need for cost-effective and efficient strategies for PGRFA conservation. Cost-efficient conservation will reduce the risk of losing unique, genetically coded information and reduce the problem of allocating an excessive amount of financial resources to conservation activities. Therefore, this chapter analyzes the national and international actors’ costs of PGRFA conservation activities and discusses existing and potential collaborations between the actors with the aim of increasing the efficiency of PGRFA conservation. Furthermore, this chapter highlights the opportunities and limitations of funding of conservation activities, especially applied to regional and international collaborations.